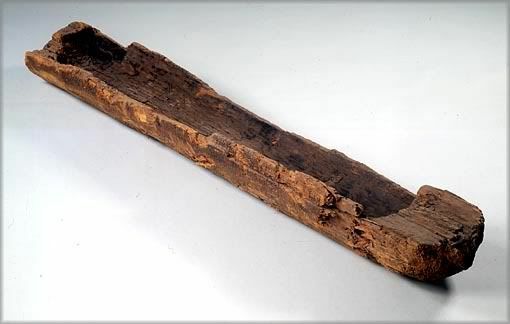 The Pesse canoe is probably the world's oldest known boat. Carbon dating shows that the boat was made during the early mesolithic period between 8040 BCE and 7510 BCE. Right now the canoe is in the Drents Museum in Assen, Netherlands. The boat is a dugout style canoe measuring 298 centimetres (117 in) long and 44 centimetres (17 in) wide. It was made from a single log of Scots pine wood. scratches are found on the walls of the canoe, these were probably made by flint or antler tools. The boat was found in 1955 during the creation of the Dutch A28 motorway. The motorway is south of the village of Pesse in Hoogeveen. To make the base of the motorway, the peat was removed, during this construction a crane operator found what he believed to be a tree trunk 2 metres (6 ft 7 in) underground. Local farmer Hendrik Wanders saw the log and took it for observation. He gave the canoe to the University of Groningen, where it was examined and freeze dried to stop decay. It was later taken to the Drents Museum, near the discovery site. Many have wondered if the Pesse Canoe was actually a boat. Some Danish Historians questioned if a boat so small could sail. In 2011, a similar canoe was constructed by Archaeologist Jaap Beuker and successfully paddled by a canoeist. Others thought that the canoe could be something else, believing it was used as an animal feeder. Beuker argued that animals were not kept by the people from the era the boat was made, so it could not have been an animal feeder. The boat is also like other prehistoric canoes. ↑ Jean Vaucher (April 2014). "History of Ships; Prehistoric Craft". University of Montreal. Retrieved 8 May 2016. ↑ 2.0 2.1 "Oudste bootje ter wereld kon werkelijk varen". Leeuwarder Courant (in Dutch). ANP. 12 April 2001. Retrieved December 4, 2011. ↑ 3.0 3.1 Wierenga, Jan (12 April 2001). "Kano Van Pesse Kon Echt Varen". Nieuwsblad van het Noorden (in Dutch). Retrieved December 4, 2011. ↑ 4.0 4.1 Beuker, J.R. and M.J.L.Th. Niekus (1997). "De Kano Van Pesse - De Bijl Erin". De Nieuwe Drentse Volksalmanak (in Dutch). Retrieved December 4, 2011. ↑ 5.0 5.1 "Kano van Pesse". Drents Museum. Retrieved 8 May 2016. This page was last changed on 7 January 2017, at 10:07.